In terms of the larger comics conventions in Australia prior to current events Supanova, Animania, SMASH!, Armageddon and the earlier Comic-Fest there was OZCON and even before that there was one event called ComicCon back in 1979. 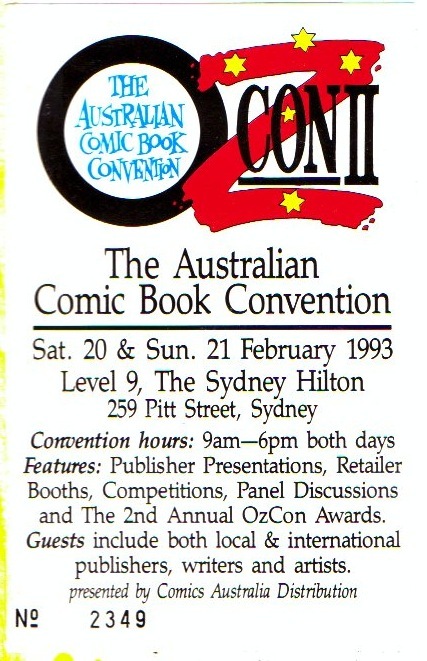 OZCON was the big annual comics convention at the time I began researching Australian alternative comics in the late 1990s. The promotion of and garnering of publicity for the more mainstream(read imported) comics seemed to be the raison d’être for the event although there was some presence by independent creators and their publications despite the cost of their participation. There was also some discussion of comics apart from the sales. I recall one entertaining discussion between Eddie Campbell and Dave Sim about the distribution of independent comics. It also provided a sense of community for local creators to meet each other, discuss their self-published comics and to compare their work to the imported product. 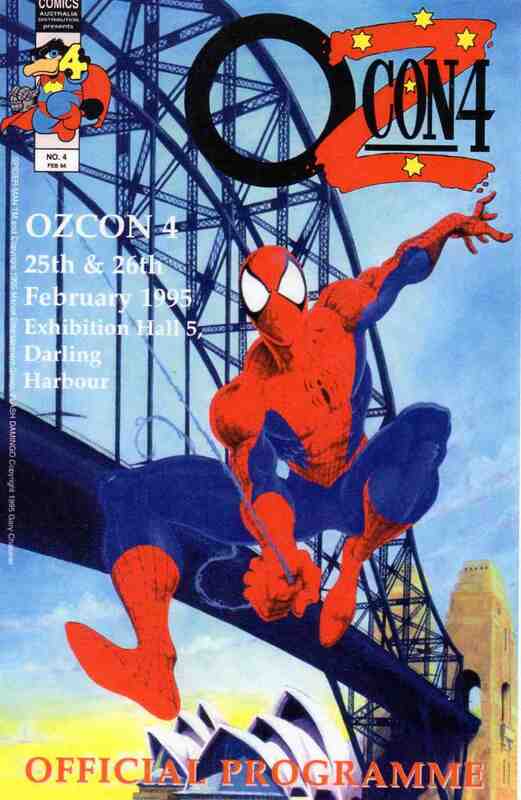 The poster shows that OZCON and Australian comics creators and fans at the time (1995) had the spectre of the US super-hero genre hanging over them. In any case it was a wonderful poster designed by local comics creator Ant Larcombe. Furthermore the cover had an inset of the avatar and character Flash Domingo by another Australian creator, Gary Chaloner. Ticket to an earlier staging of the OZcon event. Reflecting on OZCON made me think of those big US comics conventions. 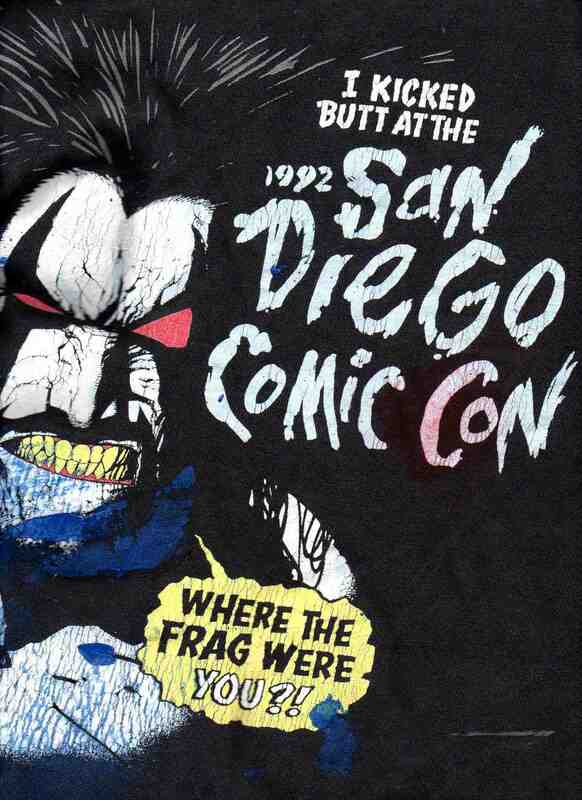 Here is a scan of the T-shirt I bought at the largest convention in the USA San Diego Comic Con. It was from an earlier staging of that event, had been discounted as a remainder and caught my eye. The in-your-face aggression, confidence, swagger and speech balloon seemed to say what that convention was about. The blue paint stains are a subsequent addition from my wearing it whilst printmaking. I think there were fewer than 50,000 attendees back in 2000 but over the past decade this convention has grown to around three times that number but remains considerably less than the 500,000 that go to Comiket in Tokyo, twice a year-that’s a million of them! Anyway I had a great time there. In addition to presenting a paper on “Australian Gothic comics” at the conference (shout out to my colleagues Randy Duncan and Peter Coogan) I got to meet Will Eisner, Scott McCloud, Gahan Wilson, James Kochalka, Roman Dirge, Jhonen Vasquez, Los Bros Hernandez, Rumiko Takahashi and Jim Woodring. This is the sixth in a series of posts called Archives of Australian Comics History that document moments in the recent history of Australian comics, particularly alternative comics and the Australian Small Press. I started researching this subject in the late 1990s and it eventually led to my PhD thesis: Ph.D. Macquarie University, Division of Society, Culture, Media and Philosophy, A Study Of Contemporary Australian Alternative Comics 1992-2000 With Particular Reference To The Work Of Naylor, Smith, Danko And Ord, 2003. On completion of the research I donated the materials and comics I had collected to the National Library of Australia: Michael Hill Collection of Australian Comics. 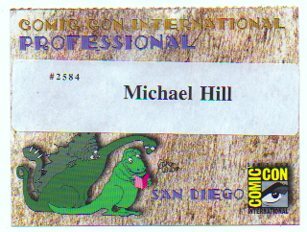 This entry was posted in Archive of Australian Alternative Comics, Art, Comics and tagged Ant Larcombe, Comic-Fest, ComicCon, comics conventions, Dave Sim, Eddie Campbell, Flash Domingo, Gary Chaloner, OZCon by Doctor Comics. Bookmark the permalink.